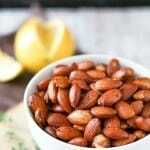 Lemon Thyme Toasted Almonds - A Fun Paleo Snack! Need a healthy snack? Almonds are perfect because they are nutty and buttery and filled with vitamins. The bright flavor lemon cuts through the richness and the fresh thyme add some floral notes. 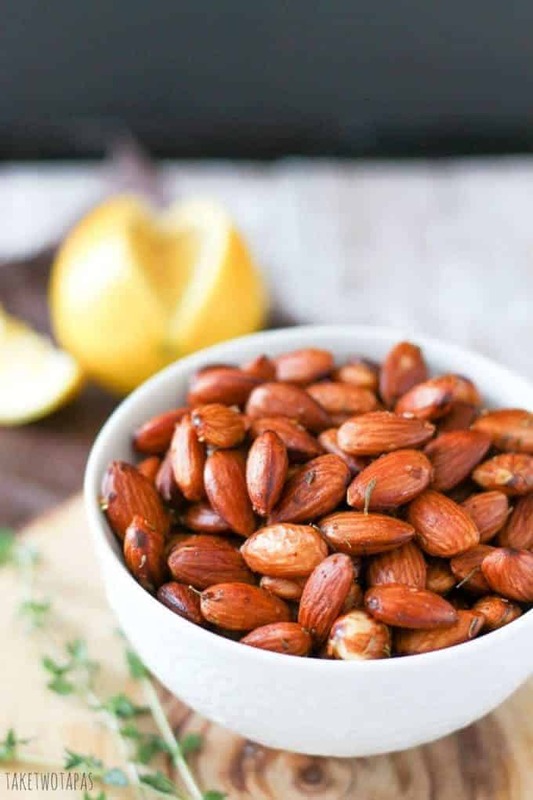 These Lemon Thyme Toasted Almonds are a great snack to keep you full between meal times! I’m coming off a month of Whole 30 and these lemon thyme almonds have seen me through the tough times! Times when I wanted to eat ice cream, inhale tacos like it was my last day on Earth, and drown my stress in a few bottles of wine, these lemon thyme toasted almonds were there. Keeping me full until my next meal of grass-fed meat and organic veggies. Doing a Whole30 is great! My poor body needed a detox after all my holiday party shenanigans! There are a few drawbacks while you are on it. Not being able to eat out with your friends without causing menu drama, enjoying adult cocktails with them, and not being able to fully enjoy going to the movies. Did I tell you how lame it is to go to the movies and not be able to eat Twizzlers and Sno-Caps while your kids are gorging themselves on popcorn and Gummy Worms? Do they even see all the popcorn that they are dropping on the floor as they are laughing at me and tossing perfectly buttered kernels towards their face? How can they waste good movie snacks when I am over here trying to get through the horror movie previews with dried apricots? Selfish ingrates! Sorry about that little rant. I guess it is time for a handful of these Lemon Thyme Toasted Almonds to set me straight again. It’s like that candy bar commercial with the divas. I am not myself when I am hungry. Eating healthy is hard in today’s world where there are so many other choices. Working from home definitely, helps because I don’t have to expose myself to them. I can get by with only stocking good choices. The best way I have found to stay on track is to make foods fun! Just like these Zesty Chili Lime Cashews and my Buttery Toasted Pecans, nuts can be fun! Adding some brightness to these already toasted almonds in the form of lemon makes them dance on your tongue and tickle your taste buds. The fresh thyme makes them seem, adult:) Keep a bag of these Lemon Thyme Toasted Almonds with you at all times for snacking emergencies! Need a healthy snack? I Toasted almonds are perfect! They are nutty and buttery. The bright flavor lemon cuts through the richness and the fresh thyme add some floral notes. 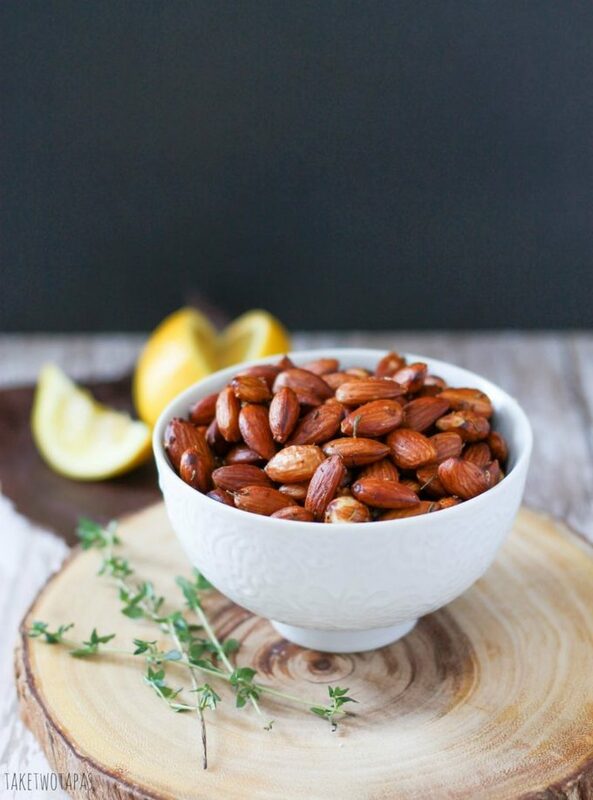 These Lemon Thyme toasted almonds are a great snack to keep you full between meal times! Toast for 30 minutes, stirring every 10 minutes. Watch carefully! If you smell the almonds, they are ready. When toasted, place in a mixing bowl. Combine olive oil, lemon juice, and lemon zest in a small bowl. Pour over the toasted almonds and stir to combine. I pour the almonds onto a paper towel after a few minutes to soak up the excess olive oil. Store in an air-tight container until you eat them all or for a week, whichever comes first. I’m excited to try these. Sounds amazing. I love snacking on almonds and I need savory options! Perfect for snacking before the wedding!! Great flavors for Almonds. The perfect snack. Good healthy snacks with lemon and thyme. Almonds making it excellent spiced nuts. Good to hear that you did whole 30 when its really hard to finish. It was so hard but I lost 13 pounds and got off sugar! I am definitely going to take the almonds for a more spicy spin next time! Thanks for reading! As I sit here eating packaged cinnamon almonds while I read this all I can think about is how much better your almonds would taste! I am on an almond kick right now, and these look like a great variety to toss into my choices! Thank you Dee Dee! I love to eat almonds as my snack but sometimes you need a slightly different flavor! These sound amazing!! Stunning pics too! Thank you Jenn! I hope you like them! These are so gorgeous, I can’t even believe how pretty these are. I love almonds so these would be gobbled up so fast here. I’ll readily admit I could never do whole 30. I just don’t think I could commit. Maybe a week. Kudos to you for not grabbing the popcorn out of their hands. You have ore willpower than I do. That is such a good idea to do lemon thyme almonds!! I love doing toasted almonds but never thought of that flavor combination. I have to try these. Thank you Julia! I love to eat toasted nuts but really love the sweet ones. I had to stop myself from eating those so coming up with other flavor combos has been fun! these nuts, though. lemon is one of my favorite flavors, I know I’d love these! I’m not a whole 30 but I could definitely go for a bowl of these. The flavors sound stupendous. It wasn’t so bad the second time around since I already had some recipes in my vault but still a major test of wills.